Frugal Mom and Wife: SpongeBob Squarepants Kid Cuisine “Splashtastic” Instant Win & Sweepstakes! SpongeBob Squarepants Kid Cuisine “Splashtastic” Instant Win & Sweepstakes! 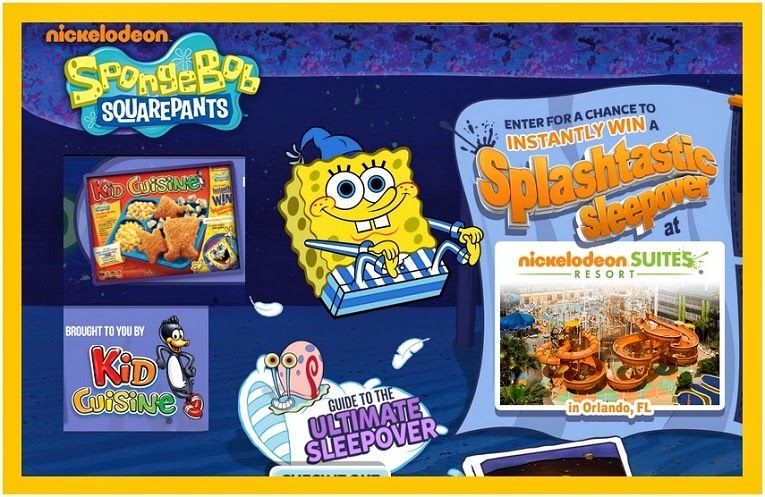 Nickelodeon is having a SpongeBob Squarepants “Splashtastic” instant win game for kids (ages 6-11), which you will see advertised on Kid Cuisine frozen meals. This promotion is two-tiered. One set of the prizes are for the online game and require no purchase to play. Another set of the same prizes are for the in-pack game, which requires a purchase of specially-marked meals or you can mail-in. Your best chance to win is to play the online game (you can play for your child) and there is no purchase required. You could win an epic SpongeBob® pajama party, tent and more! Must be between 6-11 years of age to enter. Click the “Enter Here” link below. Fill out the entry form with your name and parent’s email, then click the “Submit” button. You will be notified onscreen if you have won a prize or not. If you don’t win, you can come back and play the following day. Play the online game for the best chance to win. 1 Grand Prize: SpongeBob® pajama party for 8 people with a trip to Orlando, Florida, rooms at the Nickelodeon Suites Resort, $1,000 spending money, admission to the SpongeBob breakfast, SpongeBob 4D Movie Experience, SpongeBob gift bags, and more. Approx. retail value: $10,000.00. 500 Secondary Prizes: SpongeBob tent and push light. ARV: $23.00.